“Kokaden”is a former palace which was built commemorating 2600th anniversary of the Chrysanthemum Throne in 1940. The building was refurbished as the Museum’s Visitor Center, and it has now introductory exhibition, library, museum shop & café. Brief descriptions about the characteristic, history and structure of Japanese Architecture are displayed with panels for your easy orientation to the world of Japanese Architecture. Our library’s collection is not huge but very specialized to the history and architecture of Edo-Tokyo. The library is opened for all visitors. We do not provide copy service. There are many goods as “Edomaru” in the shop, which is a mascot character of the museum. There are also classic toys, postcards, etc. Find your souvenir here! The exhibition room changes its theme seasonally. 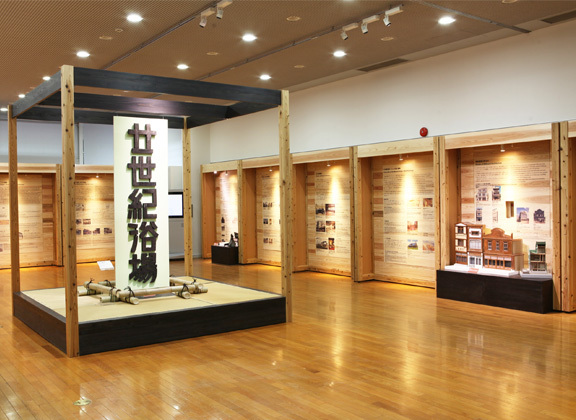 We mainly exhibit about the history of Edo-Tokyo and Tama area, and reconstructed architectures.